Having an ulcer, wound, or significant infection on your feet or ankles can be frightening and painful. Thankfully, modern medicine provides us with numerous treatment options to help you heal. If you need help with limb salvage or wound care, reach out to our award-winning podiatrist in Plano, TX. 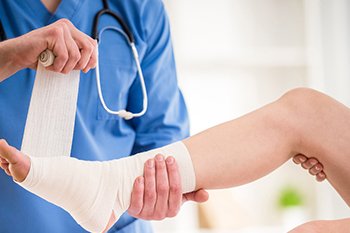 Whether your wound is small or large, our trusted podiatrists will employ their extensive knowledge of foot wound care and lower extremity wound care to help you control and resolve your condition. Schedule an Appointment With Our Podiatrist in Plano, TX, for Expert Wound Care Today! To schedule your appointment for wound care, call Dallas Podiatry Works at 972.566.7474 or click here for our convenient online appointment form. Our award-winning podiatrist in Plano, TX, will help you get back on the path to healing.